Nearly 5,000 entries from all 50 states and we had to pick just one! The competition rose to a new level this year, and the decision was harder than ever. Our judges looked at a vast array of music from every genre — and lots of music that couldn't be categorized. The creative community these days is bursting, and the diversity of sounds and people who sent us entries made for many magical "wow" moments. So, when it came time to pick a winner, we have to admit: It was tough. We debated, deliberated, championed and celebrated the entries that impressed us. In the end, it was a soft-spoken, soulful guitarist who captured our hearts. We're proud to announce this year's Tiny Desk Contest winner is Naia Izumi! Naia is a 34-year-old musician from Georgia who regularly busks on the streets of Los Angeles, where he now lives. He impressed the judges with his intricate, complex guitar playing and his sweet, emotive voice. The video he submitted for "Soft Spoken," recorded in the home studio he has built in his garage, showcases the incredible skillfulness and gentle spirit he brings to his music. Talia Schlanger, host of WXPN's World Cafe, said it this way: "The fact that Naia Izumi's solo performance captivated the judging panel, out of a sea of big bands and flashy videos, says something powerful about what a singular talent we have on our hands. Naia's remarkable creativity on the guitar, solid songwriting and gentle yet powerful charisma make me proud to root for him as our winner!" Gaby Moreno, another of our Tiny Desk Contest judges, agrees, calling Naia an "undeniable talent." "I was captivated by Naia's soulful voice, and the way he takes the unique approach to his virtuosic level of talent on guitar," she says. In the fourth year of the contest, we were simply overwhelmed by the energy, spirit and enthusiasm artists brought to their entry videos. And though there is only one winner, what makes this contest special is the way it gathers a community of artists, fans and friends together around a shared love of music. We're so grateful to everyone who shared a song, a story or a moment with us. The story of this year's Tiny Desk Contest doesn't end now that we've picked a winner, of course. Next, Naia will come to Washington, D.C. to play his very own Tiny Desk concert. Then, we'll head out on the road with Lagunitas Brewing Company for a national tour featuring Naia and local contest entrants we loved. Stay tuned for dates and more information. We're looking forward to seeing you in person. 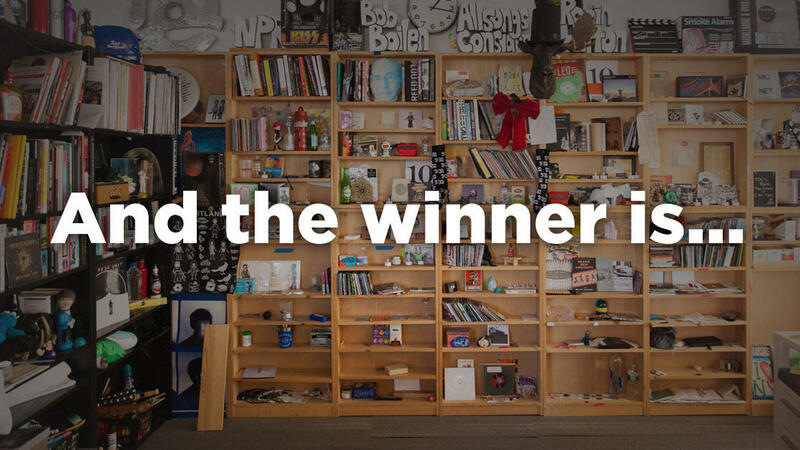 I'll be spending some time celebrating the newest member of the Tiny Desk Contest family and getting lost down the rabbit hole of all sorts of amazing entries to this year's contest. I hope this contest has brought you the joy of discovery like it has done for me. GEORGE CLINTON AND THE P-FUNK ALL-STARS: Yeah. Make some noise in here. Yeah. Let's make some noise. Right? So that's George Clinton & The P-Funk All-Stars. A couple months ago, they stopped by our studios in Washington, D.C. They set up their instruments. They tore the roof off right in the middle of the workspace. GEORGE CLINTON AND THE P-FUNK ALL-STARS: (Singing) We want the funk. Give up the funk. We need the funk. GREENE: This performance was part of an NPR Music series called the Tiny Desk Concert. Some of the most exciting talent in music comes to play short, stripped down sets in front of the famous Tiny Desk. And now for the fourth year in a row, NPR Music is offering an undiscovered act a chance. They call it the Tiny Desk Contest, and this is how it works. Artists submit videos of themselves performing. A panel of judges votes, and the winner gets a chance to play the Desk and also get a tour with NPR. Here to announce the results of this year's contest are two of the judges. Bob Boilen is the owner of that important desk. He's also the host of All Songs Considered. And also with us is Gaby Moreno, who is a singer-songwriter and guitarist. Welcome to you both. BOB BOILEN, BYLINE: Hey, David. GREENE: So how were the entries this year? BOILEN: I thought they were incredibly vibrant, from all over the country. BOILEN: All 50 states. You'd see a lot of diversity within bands. It was all over the map. MORENO: Yeah. It was very hard for me to pick. GREENE: Well, so who won? BOILEN: The name of the Tiny Desk Contest winner for 2018 is Naia Izumi. He's a young, absolutely remarkable guitarist with a soft and warm vocal. Well, play it. Just play it. NAIA IZUMI: (Singing) Back up. You're crowding my space. Hands off. It's under control. MORENO: What captivated me was just the way that he's playing that guitar. It's just so unique. He's just tapping on the fretboard, and it's just so natural. And it looks so easy, you know? And then on top of that, his beautiful, soulful voice. IZUMI: (Singing) So move out of my way. There's too many chiefs in this tribe. There's only room for one of us. GREENE: Bob, can you tell me a little bit about his story? BOILEN: He grew up in Georgia. He had to hide his music from his family, his passion for guitar, for a long time. Eventually his mom embraced the fact that he liked playing music, but he knew his dad wouldn't approve of it. He then was playing guitar and singing as a woman. He identified as a woman for a good chunk of his time in playing music. And now, and in this Tiny Desk entry, he's identifying as he was at birth, a man. MORENO: The musicality, the originality. This guy's amazing. Like, he's just what you call the exact, you know, undiscovered artist that people need to hear, they need to listen to. IZUMI: (Singing) There's so many changes. GREENE: Gaby Moreno, singer-songwriter, guitarist, one of the judges. And Bob Boilen, who's the host of All Songs Considered. Thank you both. And if you want to get to know Naia Izumi, this year's winner, you can see video of him and the song that we've been listening to at the NPR Music website. Transcript provided by NPR, Copyright NPR.